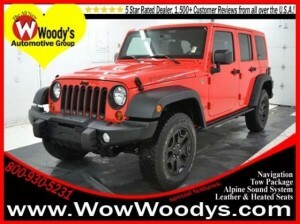 2013 Jeep Wrangler Unlimited MOAB Edition 4×4 3.6L V6 Leather & Heated Seats, Uconnect 430N CD/DVD/MP3/HDD/Navigation Touch Screen, Tow Package, Remote Start, 17 Alloy Wheels, Running Boards. **Not all buyers will qualify for all rebates, please contact your friendly sales advisor with your current zip code to access your current rebates. We will pick you up at the airport or ship your vehicle to you! If you’d like more information about this luxurious new Jeep Wrangler our huge selection of other new Jeep or 700+ vehicles located near Kansas City please visit our website and provide us with your contact information. One of our empowered Woody’s Automotive Group Sales Advisors will contact you promptly.